Gustav lives with his widowed mother in Switzerland, just after the Second World War. A young boy, he is raised by his mother to value Switzerland’s neutrality, and told to master his own emotions. Gustav forms an intense friendship with a new arrival at his school, a Jewish boy called Anton, who is set to be a piano prodigy but is plagued by performance nerves. 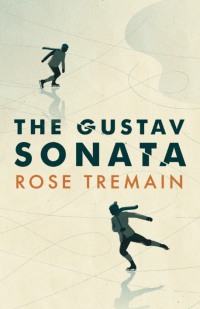 The Gustav Sonata charts their lifelong friendship, showing the complexity and importance of such relationships in a way that reminded me of Elena Ferrante’s Neapolitan Quartet. Gustav’s father was a Swiss policeman – but how did he die, and does it have any connection with his mother’s strong dislike of Anton and his Jewish background? But neutrality and mastery may not get you the intimacy you crave. To be connected with life and other people, you might need to take risks. And isolation is not a neutral state. I am a Tremain fan, especially of her outstanding novel Sacred Country, a great story about a trans person. But you don’t have to be a fan of hers to enjoy The Gustav Sonata, as it’s a very readable and thoughtful historical novel. In her exploration of the gaps in what people kept silent about after the Second World War, she evokes some of W G Sebald’s concerns. But the theme of friendship remains the primary concern, and she does justice to the epigraph she has chosen from Montaigne: “If anyone should importune me to give a reason why I loved him, I feel it could not otherwise be expressed than by making the answer, ‘Because it was he, because it was I’”. International human rights barrister Philippe Sands opens his remarkable new book with a quote from Nicolas Abraham: “What haunts are not the dead, but the gaps left within us by the secrets of others”. 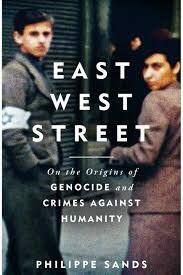 Sands tries to fill some of these gaps in the stories of both his family and two lawyers who developed the legal concepts of genocide and crimes against humanity that featured for the first time in the Nuremberg tribunal – Hersch Lauerpacht and Rafael Lemkin. Remarkably, there turn out to be connections between all of these people and the (now Ukrainian) city of Lviv, a site of mass murder of Jewish residents during the Second World War. The best thing I’ve read this year, East West Street is both personal and international in scope. Sands undertakes remarkable archival and other research and succeeds in uncovering surprising and illuminating stories, which help to explain both how international law developed as it did and why it was important that it did so. In this he echoes the approach of Hartley Shawcross, British prosecutor at Nuremberg, who in his closing trial address used a single devastating case study to force home the inhumanity of Nazi war crimes (Sands recounts this at p. 346-7). It takes a skilful and confident writer to manage the risks involved in bringing the huge themes of history back, over and over again, to real individuals. He does so seamlessly, creating a book that reads as compulsively as a detective story. The photos of people and original documents scattered throughout the text make it even more engaging. The related film, My Nazi Legacy: What our Fathers Did, is also well worth watching (http://www.wildgazefilms.co.uk/my-nazi-legacy-2015/) . Sands’ perspective as a lawyer involved with the International Criminal Court and war crimes tribunals from Rwanda to the former Yugoslavia makes the work highly relevant when thinking about human rights now. 70 years after Nuremberg, how do we deal with crimes against humanity? Do we have the courage required to remember that real individuals are caught up in these huge convulsions, and the greater courage not to look away? “There is so much in this world to make me happy. Small things such as cats, a good meal, one’s garden, trees in spring and autumn, clouds, colours, fabrics, clothes, companionship, books and music and films, a dri nk in the friendly atmosphere of an English pub, a ride in a bus, a letter from a friend, staying in bed when one is tired, firelight, starlight, waves breaking against rocks, evening sunlight on a flight of bombers”. Jean Lucey Pratt writes this in 1944, aged 34, a woman living alone and working in Slough as the bombs fall around her. She takes much joy in life, as this extract shows, and is not afraid of giving her own views on the remarkable times she’s living through. In these edited journals, started when she was 16 and continuing into old age, she is painfully honest about her romantic life (I was absolutely willing her to find someone half decent to get off with). Like all the best published diaries, we feel that we are getting a view into someone’s secret inner life, but she also illuminates the uncertainties of living through a time of great international and domestic turbulance. Jean is anything but fluffy, despite the excellent cats that march through these pages. 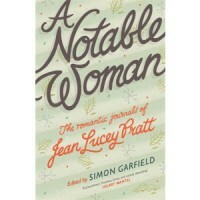 Her diary is a real page turner, and well edited by Simon Garfield (who has previously published some of her contributions to the Mass Observation study). I enjoyed spending time with her enormously, and only wish she could have seen this delicious volume published during her lifetime.